American Policing, EU Immigration and Kalergi – ITEL Radio – 9.19.15 | Inside the Eye - Live! Inside the Eye – Live! for Saturday, 9.19.15, returned to Amman, Jordan,discussed elements of US policing tactics, the current European disaster surround “immigration” and the Kalergi Plan, and then ended in a flurry of listener participation phone calls. It was a relaxed, but fast paced show with “The Fetch” imbibing in a drink or two as a counter to comments in the Inside the Eye – Live! chat room, the end result of which was a pretty fun and entertaining final hour. The show began discussing the recent assassination of an American citizen by San Bernardino sheriffs in the greater Los Angeles area. As many are aware, ne’er a week goes by when there is not some police car chase on the streets of the greater Los Angeles area. These chases seem to be a never ending source of television entertainment for the locals in Los Angeles. In this case, the suspect (deceased), a Mr. Nicolas Johnson, was wanted for a prior home invasion. When trying to make a traffic stop, the suspect fled, leading law authorities on a high speed chase that according to SB County Sheriff’s department spokesman, reach speeds of up to 100 mph. Upon entering the 215 Fwy going in the wrong direction, a sheriff deputy began shooting at the suspect from an airborne helicopter. Now entering a freeway going in the wrong direction is not what one would call a sane maneuver to making when trying to avoid the police, and no one wants to de-fang police and sheriff’s from doing their jobs: they do serve a purpose. The problem, however, is that this shooting just highlights the terrible toll police are taking on Americans in general. According to Killedbypolice.net, policing departments in the United States have killed at the time of this writing, 867 people, and it would be exceedingly naive to believe that all of these, or even most of these, were “justified”. 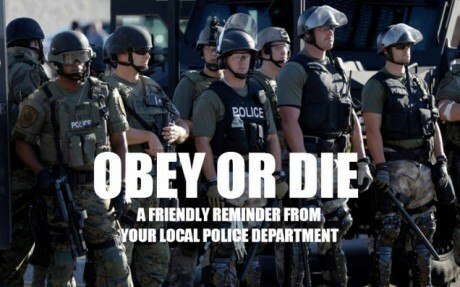 Rather, what we are witnessing is a dramatic shift in policing in the United States which is being referred to as “comply or die”. The reality remains, police are increasingly being dumbed-down, with IQ’s required to enter the police force kept artificially low. What we are witnessing in the United States is a policing paradigm where police are essentially acting as judge, jury, and executioner. 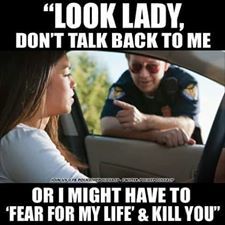 This reality simply cannot be tolerated in a free society, as it makes police often as much, and in many cases, much less predictable and dangerous than criminals themselves. It could be further argued that policing in America is rapidly becoming a form of criminal syndicate in and of itself, with SWAT (Special Weapons Assault Tactics) being deployed even for such minor issues as “collecting debts”. The end result of such heavy handedness by police is a risk that the police will become completely detached from the citizenry with an ensuing “war on cops” being instigated. America is not there yet, but it is a reality that police seem to be preparing for as they continue to militarize across the nation in ever increasing levels. The continuing news coming out of Europe makes is rapidly apparent that European governments are either a) a complete incompetent wreck or b) an occupied force wholly disconnected from the interests of Europeans. The reality is that the problems besieging European populations is a combination of both and more. From a humanitarian point of view, the reasons for the crisis are not simply “wars” started by “the West”, although this certainly plays a role. 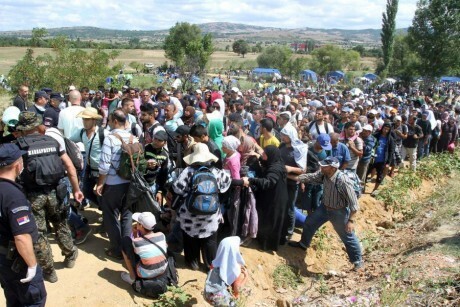 The reality is, European governments are simply out of touch with how to handle such a crisis, or they are using the ongoing conflicts as a screen to enable and justify unbridled immigration (invasion) of European countries by third world populations. Turkey, Lebanon, and Jordan, for instance, have had to deal with quite a bit more refugees than the current crisis, but each of these countries have established camps that do not permit the migrating refugees into the local economies. Europe, on the other hand, has thrown open their borders and have a welfare regimen that encourages economic migration equally under the cover of conflicts. Another factor that is most likely in play is the more hidden agenda known as “The Kalergi Plan”. The Kalergi Plan envisions a total destruction of European populations (genocide) and replacing Europeans with third world “colored” races. The ongoing “crisis” in Europe appears more to be a “quickening” of the Coudenhove-Kalergi Plan, perhaps partially due to the rising tide of nationalist political forces in virtually every European country.